Earlier this year I was on a flight from Auckland to Canada which had to make an unscheduled stopover in Hawaii to offload a passenger who had become seriously ill. I was very impressed by the way the Air New Zealand staff handled the incident and went about making sure every passenger was catered for in terms of their plans once they arrived in Vancouver, and whilst there was the inconvenience of having my sleep disrupted and having to wait for a bit in Vancouver for a new onward flight to Toronto, the general response of passengers was one of understanding and tolerance given the plight of the person needing to be offloaded – although I was within earshot of one person speaking quite angrily to his colleague about how he was now going to miss his onward flight, and how inconsiderate it was to divert the plane for the sake of just one sick passenger… (and on he went). Seriously? Someone was threatening to sue? Who? And for what? And why?? The point of my morning reflection is that all of this reminds me of the work I do in schools on a regular basis at the moment, helping design learning for students where they are given more choice, responsibility and ‘say’ over their learning – i.e. more agency. The simple definition of agency means that you have choices and the ability to act on those choices. In this modern age of travel we are privileged to have so many choices available to us, including modes of travel and places to travel to. If we decide to travel by air our choices extend to where in the plane we might sit, what movies to watch and what sort of menu we’d prefer to be served for instance. But agency isn’t about making these choices based purely on our own preferences and needs. The process of making these choices will necessarily take into account the preferences and needs of others who are sharing the experience – and will be limited by choices made on our behalf (i.e. by the airline) about the seat fittings, the range of movies on offer, and the temperature of the cabin etc. We’ll take our turn to visit the bathroom and conform with requests to turn the lights out during ‘sleep time’ etc. As teachers and schools make changes to the way they work with their learners – moving from a largely ‘transmissive’ mode of teaching, shifting the locus of control in the classroom increasingly to the learner, offering him or her a greater degree of choice and ownership over what is learned and how it is learned etc. – it is important that this view of agency is maintained. Generally this process is resulting in greater levels of engagement and participation in learning, leading to increased levels of achievement. It’s not always an easy road to get there however, with some educators not appreciating their role in the process, mistaking their supporting this shift in ownership for an abdication of responsibility. Providing students with the opportunity to have more control of their learning and to take greater responsibility for all aspects of that is not about simply letting go and dropping them in the deep end. Neither is it about pandering to the specific needs of an individual student at the expense of all other learners in the cohort. To neglect the focus on the broader definition of agency will result, as illustrated in the airline delay stories above, in the individuals mistaking the privilege of agency for the right of entitlement. There is close relationship between the fully realised characteristics of agency and the development of collaborative practice – for me the two go hand in hand. To be fully agentic means you are not only experiencing the personal fulfilment of being able to act on the choices before you, but you acknowledge and respect the concept of the social contract that enables us to exist in a synergistic way with those we share your environment with. Sadly, this confusion exists in many areas of our society today, with the focus on ‘self’ and the sense of entitlement evident in so many areas – this is why the focus on learner agency in our education system is so important – and even more important, that it is done with a deep understanding of what agency is all about! The centre will be established by the Education Council of Aotearoa New Zealand, the newly formed professional body for teachers, and will be partially funded by the Ministry of Education which is contributing $250,000 to its set-up costs. Its initial focus will be the principals who have been selected to lead the new Communities of Learning established to foster systematic collaboration across the education system. The Teacher's Council has been preparing their thinking about future focused leadership, and have just published their paper on Leadership for Communities of Learning (pdf download) which has been authored by Robyn Baker on behalf of the Council. 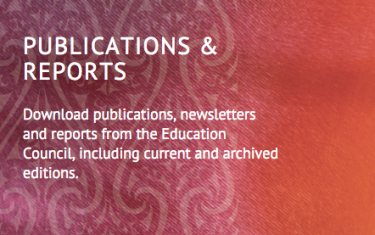 This paper is a synthesis of the five "Think Piece" papers (pdf download) that were commissioned by the Council from five educational leaders in NZ. I was the author of one of the papers – on Networked leadership. My perspective is that as we embrace the thinking and activity of the Communities of Schools we must avoid thinking of them as simply another structural or organisational change in our schooling system, but rather a fundamental shift towards operating as a networked culture and as networked organisations. Leadership in this environment must be thought of and enacted quite differently from what we've experienced in the past. It will require considerably different mindset, based on deep collaboration at all levels, and the sense of being connected to something bigger than oneself and ones own (local) institution. It will require a fine balance of three perspectives, leadership of the organisation, leadership in the organisation and leadership as the organisation. moves from hierarchy and heterachy to holarchy, understanding that the conventional 'power-oriented approaches to leaderhsip no longer apply. 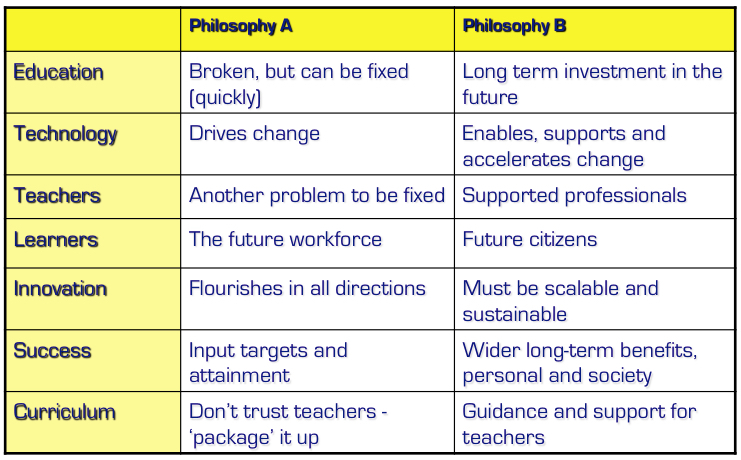 My hope is that this new centre will embrace this thinking (along with the key ideas presented by the other four authors) to create and promote a truly future focused view of leadership for our schools – not simply a regurgitation of all of the leadership thinking and theorising that has shaped our past thinking. Of course, there is much value in a lot of that thinking – but as we bring it forward to the present, it needs to be located within the paradigm of the networked organisation in the networked age. And that's something we're all going to have to imagine and co-create as we move forward. I was working with the staff of a local secondary school yesterday, and in the context of our discussion we shared our thinking around the question of 'what is success?' in relation to the purpose of school and schooling, and the focus on assessment that currently dominates much of the thinking in our school system and drives most of our curriculum design and delivery. "We need to think differently about what schools are for, about what students should learn in them and about how we should measure the “success” of all this. (p.4)"
The definitions of 'success' and 'being successful' lie at the heart of the design of our schooling system, and drive the activity of everyone in it – from the policy makers through to the students in classrooms. From a current analysis of what we see happening in the NZ school system it wouldn't be difficult to conclude that what we regard as success is intimately tied to academic achievement, and the relentless pursuit of excellence and results measured in terms of standards at a national level and our comparative rankings at an international level. Now as an educator I'm not going to argue that academic achievement shouldn't be a key focus for schools – but we do need to consider whether there's more to it than simply that? If we aspire to engage with and grow young people and see them develop as citizens into the future, ought we not be thinking about more than simply academic success as measured by (in the most part) summative examination scores? While many may argue that the curriculum and educational discourse here in NZ has moved past this narrow thinking of success, the evidence I see when visiting schools and talking with students (particularly at this time of year when exams are the focus) would suggest that academic success is definitely the high priority for most. An article in yesterday's Toronto Star highlights how this should be a concern for all educators – from policy makers to teachers, and parents as well. Titled "Student Stress Must Be Addressed" it begins.. Professor Shankar's research is part of a broader move, launched by People for Education, to have schools actually measure how well they foster social-emotional skills, citizenship, physical health, creativity and a positive school climate overall — beyond the 3 Rs. Such concerns would resonnate with the group I worked with yesterday, where student welfare ranked towards the top of every group's list when we were considering the priorities for the design of new approaches to learning in the school. 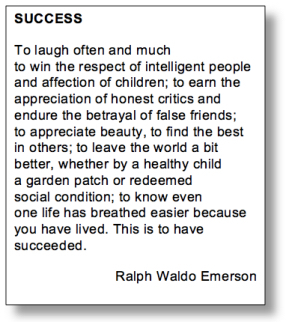 Perhaps we need to reflect more seriously on the words of Ralph Waldo Emerson and consider how, in the frentic busy-ness of our lives in and out of school, we make time to embrace the significance of these measures of success for ourselves and our learners. I presented a talk on leading change in a networked world to the School Leaders Network in Christchurch yesterday afternoon, focusing on the importance of understanding the emerging paradigm of the networked world and the implications for schools and school leaders. Education is not centrally about test scores but about preparation for life in its broadest sense. be aware of these competing philosophies and how they play out in the political directives we face, the expectations of parents, and the underpinning behaviours of teachers. understand that they are simply competing ideologies, and that we need to intentionally and intelligently reflect on our own ideas and understandings to identify our personal beliefs and where this positions us in the various continua. seek ways to lead those in our school communities to estbalish and articulate the shared beliefs that will underpin what we do. work with our teams to explicitly link our practices with these beliefs, to ensure our coherence between our espoused theory and our theory in practice. My key message to the APs and DPs at the meeting was to ensure that their thinking and planning is anchored in a 'Future Focused' mindset – not simply replicating what we've done in the past. This is where the emphasis on considering education as a 'networked' endeavour comes into focus – challenging our existing assumptions about the stand-alone school, competitive mind-sets and 'patch protection' among other things. Food for thought – lots to ponder here…. Many of the children in the city today cannot remember a world before the earthquakes. The presenters in this TVNZ documentary ask how this has affected their wellbeing by visiting South New Brighton School in the heart of the most affected suburbs. As someone who has visited this school, and knows the principal and some staff, I found this a very poignant and informing piece – so am sharing it here to inform and inspire others. It reveals..
the resiliance of the young people – but also their fragility. the importance of schools as a focus of community, and a place where there needs to be opportunity to attend to the things that are important in the lives of the children and their families – in addition to the focus on learning. the enormous responsibility placed on the shoulders of school leaders to cope with all of this – on top of them having their own families, homes and personal health to consider. the restorative effect of a team of dedicated teachers committed to meeting the needs of learners – supported by other professionals with complementary skills. It will be some years before the 'new' Christchurch is fully established, and in the meantime I pay full credit to the dozens of school leaders, staff and their communities who are working constructively and collaboratively to provide the sorts of support and opportunities portrayed in this clip. Teachers and school leaders are being challenged to transform educational outcomes, often under difficult conditions. They are being asked to equip students with the competencies they need to become active citizens and workers in the 21st century. They need to personalize learning experiences to ensure that every student has a chance to succeed and to deal with increasing cultural diversity in their classrooms and differences in learning styles. They also need to keep up with innovations in curricula, pedagogy and the development of digital resources. The challenge is to equip all teachers, and not just some, for effective learning in the 21st century. This will require rethinking of many aspects, including: how to optimize the pool of individuals from which teacher candidates are drawn; recruiting systems and the ways in which staff are selected; the kind of initial education recruits obtain before they start teaching, how they are monitored and inducted into their service, and the continuing education and support they get; how their compensation is structured; and how the performance of struggling teachers is improved and the best performing teachers are given opportunities to acquire more status and responsibility. The extract above comes from the foreword to the OECD publication Building a High-Quality Teaching Profession: Lessons from around the World which summarizes the evidence that underpinned the first International Summit on the Teaching Profession held in New York in March 2011. The status of teachers within a community/country has been identified in the OECD work as a common characterisic of those countries where student achievement is highest. Since the publication of this report there has been much written and acted upon in OECD countries around the world, including New Zealand, to help raise the status of the teaching profession in order to attract and retain the very best teachers we can. The announcements made earlier this year by the New Zealand government of plans to recognise the contribution of our best teachers is premised on this objective. Whether we agree with the strategy or not, the fact does remain that we are suffering in New Zealand from teaching being regarded as a lower status job, indeed, seldom referred to as a profession in many circles. Within these (4 & 5 above in particular), professions are usually identified by the autonomy they exercise in terms of maintaining the integrity of the knowledge and actions of their members, including the induction of new members into the profession. In terms of what sets them apart, many would argue that it is the monopoly over a body of theoretical knowledge which is the most fundamental characteristic of professionalism because it creates the need for the other elements. Also to consider is the fact that the conditions under which teachers carry out their professional tasks have changed significantly in the past couple of decades, so that the predominant pattern is no longer that of the free practitioner in the provision of services, but that of the salaried specialist in a large organization, where the determination over things like the national educational goals, national curriculum, national standards etc. reflect the tension between a government taking action to address issues of national significance (in their view), and the profession acting with autonomy and professional knowledge to address the same things. This tension is highlighted for me as I read the announcement from the UK earlier last week, about the establishment of new teachers' body that aims to advise the government there on curriculum development. The sub-heading for the articles states that "the proposed College of Teachers will seek greater autonomy for teaching profession and reclaim ground from government". Some quotes from teachers reported in response to this initiative suggest this is a positive move..
"Simply bumbling through for a four year political cycle is not appropriate and does little but cheapen the profession and the education that can be provided." "It makes much more sense for excellent teachers to be at the forefront of driving standards forward than policy makers who are usually looking in from the outside with no real experience of teaching." "Typical state teachers. They want the funding, juicy pensions, bags of holidays and early retirement but accountability? No. They hate politicians, policy makers and the govt. Teachers call it interference, I call it accountability. Leave teachers alone and you end up with sliding results.. "
"Next thing you know teachers will be getting input into what goes on in schools – acceptable student behaviour, setting curriculum, student testing, etc. How absurd!" "oh dear oh dear oh dear – all we need is teachers getting more autonomy …again….the lunatics take over the asylum. here we go ..>> back to the 70s – teachers decide content, methodology, assessment….i was there – i KNOW what happened"
So the issue is indeed complex. There is no doubting that the status of the profession requires improvement. While I support the introduction of strategies such as has been announced here in NZ, it will take significantly more than this to achieve the raising of the status of the profession in order to regain the trust of the community, and to attract and retain high quality teachers within it as identified as being so important in the OECD research. This must start with those of us in the 'profession' itself, taking greate professional responsibility for the things that matter, and demosntrating professional responses to the various political and societal pressures that impinge on our practice. We must also demonstrate a professional approach to workling together to re-think and re-imagine what the nature of our profession and our professional context(s) might be like in the future. Education levels rising among the general public (everyone is an expert nowadays, or has access to expertise to challenge that of the teaching professionals). ICTs are becoming increasingly sophisticated, providing access to specialist information/knowledge and programmes of learning (thus taking away the teachers' monopoly on knowledge). New occupations of para-professionals cutting into the teaching professionals' knowledge monopoly. Consequently, the whole question of whether teaching is a profession, or can become one, is a bit of a red herring. The real issue is the degree to which teachers can resist deskilling and maintain some measure of autonomy within the schooling system. For that to happen I believe we need a complete re-think about what our schooling system might be like as we sail merrily into the 21st century using 20th Century models of thinking supported by a 20th century Education Act that fails to place the learner at the centre of all subsequent policy and resourcing decisions. Shifting to the digital age? Those strategies reflect a shift underway at some teacher colleges that are working to revamp their programs to improve the technology literacy of future educators—and address what many see as a major shortcoming in the profession. You'll have to excuse my cynicism, but I found myself checking the date-stamp of the article to check that I wasn't reading something that should have been news two decades ago! As a school principal in the 1980s I introduced computers into my school, recognising then that digitl technologies were going to change the world that my students would be growing up into, and that enabling them to become familiar with how computers could enhance their ability to work with information and communicate with others (yes, before the Internet we used StarNet!) was going to be an essential competency in their lives. Following that I spent all of the 1990s working as a lecturer in educational technology at a pre-service teacher education institution. In that time I saw the introduction of computer labs, the Internet and digital photography as a part of the courses taught there. That particular institution has been running a 'digitial classroom' for more than a decade. Yet somehow there remains the perception that our pre-service teachers still aren't being prepared with the 'technology literacy' they'll require to teach effectively in the digital age. I hear the comment often expressed by NZ school principals where every effort has been made to integrate digital technologies into the classroom programmes in their school, but they find it difficult to recruit new teachers who are sufficiently 'digitally literate' to seamlessly embrace these practices. For me the problem needs to be addressed more broadly than simply confining attention to initial teacher education programmes (although they certainly need to be in the mix) – we need a more comprehensive system-wide 'kick in the pants' to accept that digital literacy is indeed an essential competency for all teachers and students in our third millennium education system. Four decades after the first computers began appearing in classrooms why is it still news that our teacher ed programmes are now "seeking ways" to address this "shortcoming in the profession"? Those charged with helping teachers weave technology into their instruction say doing so will take time, given that change doesn't necessarily come easily to colleges and universities steeped in tradition. "This is all still fairly new for a lot of us in higher ed.," said Ms. Herro of Clemson. "The idea that we no longer hold all the expertise is hard to accept." Magic Makers Trailer 2014 from Melissa Jun Rowley on Vimeo. Looking for inspiration as you start the new year back at school? Here's a heads-up on a new US TV series called MAGIC MAKERS: highlighting the next generation of science and tech innovators who are addressing the world's toughest problems. Take, for example, Jack Andraka, a 16-year-old who created an accurate, cost-effective tool for early cancer detection. He is just one of nine exceptionally smart and talented young men and women on the show. The campaign is currently live here, running through the next month. and you can check out the video to get a better idea of who's involved. The producers are currently crowd-funding and seeking sponsorships toward the $75K needed to produce a professional-grade pilot episode – I wish them well with this as these programmes capture the ideas that can inspire both teachers and students alike. Please help spread the word. But the lack of connectivity hasn't stopped me thinking about the year ahead and the challenges we face as educators to make what we do relevant and meaningful in the lives of the learners in our care. The quote at the top of this post is often attributed to Albert Einstein, but was first said by Henry Ford (Einstein did say it too, but differently). It's one of those sayings that confronts us with what is so patently obvious. Self directed learning in the digital age – this article by Amy Harrington in WIRED magazine makes the case for a personalised, self-directed approach to learning, enabled by technology. She argues tht it is infinitely more useful to be able to think critically, brainstorm ideas and figure out how to solve problems then it is to be able to recite a list of facts. Using blended learning to improve teaching – this useful infographic makes a case for using blended approaches to help teachers stay on top of their game. The writers claim that blended learning environments can create more and better opportunities for teacher collaboration, enable differentiated staffing and boost meaningful professional development opportunities. Gamify your classroom – the concept of gamification is gaining currency in educational discourse at present – and I'm a fan. This article by Mike Acedo provides ten specific ideas for game elements are applied in an educational context. Gamification refers to where the structure of (online) gaming is applied to a non-game framework – i.e. the regular classroom environment. Mike's tips are very practical and easily applied. 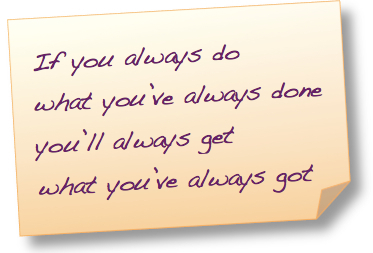 As we begin the new year of teaching, my challenge is (for myself and the teachers I work with) that we'll actively 'think differently' about what we're doing adn the approaches we are taking, and accept the challenge to explore some of the new ideas that are emerging that can enable us to make learning engaging, relevant and successful for the learners in our care. Happy New Year to you – let's make it one that releases the creativity and transformational thinking in our profession! 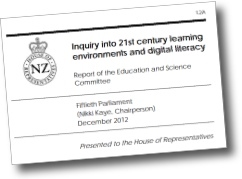 The long awaited report from the parliamentary inquiry into 21st Century Learning environments has just been released and makes for some good reading IMHO. I had the opportunity to contribute to four of the submissions made to this committee, wearing different hats for each, and so have a keen interest in the process and its outcome. Despite the rather confusing terms of reference that the committee was charged with reporting on, the final report provides a pretty fair summary of the things I heard being discussed by the submitters I spoke to. The latter part of this recommendation could apply to a myriad of programmes and projects within the education sector at the moment where significant change appears to be the norm. This is highlighted for me as I read another report released today, this one from the ombudsman's office, concerning an investigation into the Ministry of Education’s management of OIA requests about proposed Christchurch school closures. The apparent breakdown here is a failure to demonstrate leadership in the way communication was (or wasn't) maintained with the wide range of stakeholders as the Ministry worked with them (and the Council) as everyone worked together to develop and implement a shared vision. This, together with today's announcement of the resignation of the Secretary of Education, demonstrates to me that we have a crisis of leadership in our education community at present – at a time when, more than ever one may argue, it is required. The point I'd like to emphasise here is the fact that the sort of leadership being urged in the select committee report isn't bound up in a single person – it is government and sector-wide leadership. The call is for a unified and focused approach across the sector, an approach that reflects then the process of consultation and engagement with the sector and stakeholders. That is the leadership we need. Back to the parliamentary inquiry report, setting aside the fact that most of the recommendations are couched in non-committal language that the cynics will recognise allow freedom for political 'wriggle room' (the word "consider" appears 27 times in 44 recommendations, along with 'investigate, "explore" and "review" for instance), the themes and issues raised by the recommendations are all very worthy of consideration and important to be addressed. Taken together, these recommendations have the potential to form the framework of a vision to be promoted (something we don't currently have, unless you consider a focus on system deficits a vision). These recommendations allow us to think aspirationally, to consider a future that is bigger than what we currently have, and opens up the opportunity for conversations about system level change in structure and thinking that could create a better learning experience for our young people. It is encouraging to me that, in relation to an inquiry into learning environments, a substantial amount of discussion is devoted to the virtual world, and the anticipated role of the Network4Learning. I am a strong advocate for the inclusion of the virtual in any discussion about 21st Century learning environments, as already we must acknowledge the significant amount of learning that takes place outside of the school environment, and of that, an increasing amount takes place online. In the recomendations I am pleased to see mention of community use of school IT facilities, as well as school use of community owned IT facilities (libraries included). This all seems to make sense to me – something I've advocated for some time, and which has been effected here in Christchuch with the South Learning Centre and Riccarton Library for some years now as an example. The report also addresses some of the digital divide and privacy issues that will inevitably arise as we move in this direction. It's pleasing to note that the report has the support of the Labour Party and the Greens (in principle at least, with their obligatory extra points noted). Let's hope the government now looks seriously at the recommendations in this report, with an horizon that stretches well beyond simply 'considering' and 'exploring', to actually taking some hard decisions, showing leadership, and inspiring leadership in others. We need all of our politicians and sector leaders too to take serious note of the recommendation "…that the Government recognise achieving such a change needs government- and sector-wide leadership to develop and promote a vision, and to lead an integrated series of work programmes to implement that vision."